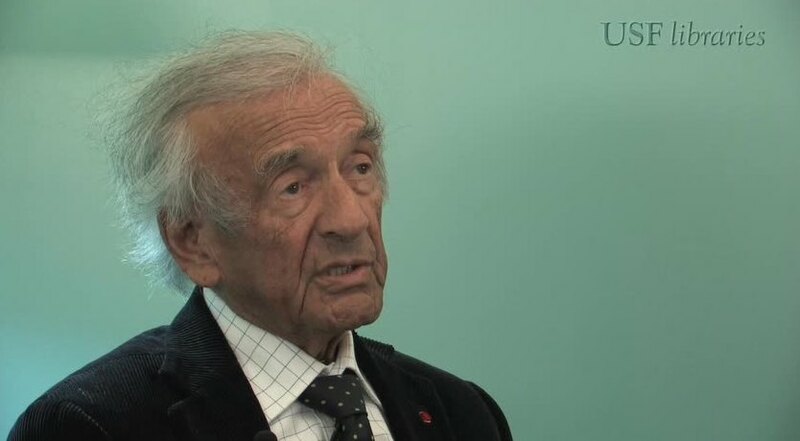 Elie Wiesel, Holocaust Survivor and author of Night. What we learned first of all is that the role of the witness is of absolute importance. For who is a witness, someone who says, “I was there.” Or, “I saw it.” Or “I spoke to a witness.” To become the witness to a witness is as important as to be a witness. And that is—that is, of course, a precondition, not only for memory but for education. How can one live today, for instance, without realizing that in those times, those times, the whole world was involved for good or bad. On one side, of course there were the good. On the other side there were the bad and their assistants and their collaborators. What made them to do what they did? What made an executioner be capable of—of eating a morning breakfast and lunch and then afternoon, go and kill Jewish children? And come home, speak and—and play with his children? What made him human? Because he was a human being after all? What’s it say about the humanity of the human being? Is it a—a—too much to say that in those times, it was human to be inhuman? To shoot a part of humanity? And that is the tragedy. Too easy to say, “God made us do it.” God has other things to do.